If you’re a tournament angler at all serious about your success, you need to use the Internet to promote yourself, your sponsors and to attract more sponsors! A well-designed website can work for you 24/7, 365 days a years! Your website is always on, providing useful information to anyone interested whether a fan or a potential sponsor! Being a good angler is important to tournament success, but the business side of being a tournament angler can be just as important to financing long term success, especially if you want to or are trying to fish at the upper levels. Tournament fishing isn’t cheap. Attracting and keeping sponsors only becomes more critical with each tournament level. With so many anglers fishing their way through the various tournament levels, it’s more important than ever to stand out from the pack! A professionally designed website gives the impression that you are serious about your fishing and about promoting sponsors! If done correctly, websites can look professional at many levels too from very simple with a few pages and some information about you to full-blown community sites with members, social feeds and video to build and keep a constant following. This allows a wide range of options to fit almost any tournament angler budget while still giving you the leader of the pack appearance! AnglerHosting.com knows about tournament fishing, sponsors and promotion along with the costs and challenges in being a tournament angler. We also understand that every tournament angler can benefit from better promotion and more sponsorship assistance. Which is why we are flexible in our options with websites for many budgets while still building quality sites you can be proud of, that people can find, and that can be expanded when the need arises. 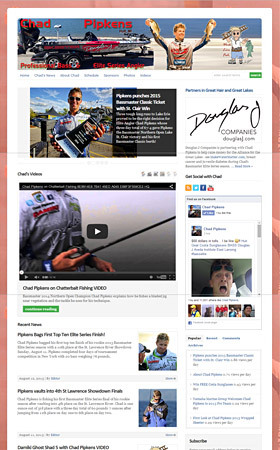 While AnglerHosting.com believes almost any competitive tournament angler can benefit from a website presence, a common mistake we see many young tournament anglers making is not securing their name – their identity – on the Internet through a domain name. While there are laws about protecting trademark names in domains, it is less clear when it comes to a person’s name. Regardless, it is very expensive to get a domain away from someone – thousands of dollars. For less than $15 per year, you can get a domain name for your fishing identity and keep it from being hijacked by someone else if you win that big tournament. This does happen – someone registers your name hoping to get a bunch of money from you. Settling for a lesser domain name costs you traffic, promotion and confusion. At minimum, you should secure your name as a domain right now. You can register your domain name through us and/or if someone already has registered your domain, we can help you find the next best available name. Website Management – for the busy angler or the angler who just wants to concentrate on fishing and other aspects of tournament fishing, we can also manage your website for you, again meeting many budgets by adjusting the level of services we provide to you. Quarterly Sponsor Reports – Too many anglers don’t report back to their sponsors and in this increasingly tight economy, this is another way to lead the pack – a professional looking report to sponsors. They won’t know you didn’t do it yourself. You just provide the information and pictures. Social Feed Updates – We can help you setup and manage your Facebook page or a Twitter account if you want to use these valuable tools to build a fan base and serve sponsors better. Some of our websites include automatic social feed updates. Visit our Services page for more information or contact us if you want help with any of these services or to ask us how we can help you lead the tournament pack within your budget!